InterSystem have now delivered more than 100 palletizers to the Norwegian market. The machine number 100 is a ComPact 128L-MAX and were supplied to the company Lerum AS. The derivery was done during the move of the jam production from Sogndal to Kaupanger. Mr. Kurt Lerum was the man behind the move and also responsable for the project. The company Lerum was founded in Sørheim 1907, located in Sogndal Norway and is managed by the 4th generation of the family Lerum. The company is most known for its production of juice and jam. Moving the production was a big project but necessary to remain market leader for jam and juice on the Norwegian market. Lerum have a long and good experience with InterSystem. They purchased their first palletizer 1996 and have now four machines in total. In the new production facility, the latest palletizer is placed between two old palletizers from InterSystem. The new palletizer is also equipped with a sheet layer unit for applying in-between sheets. 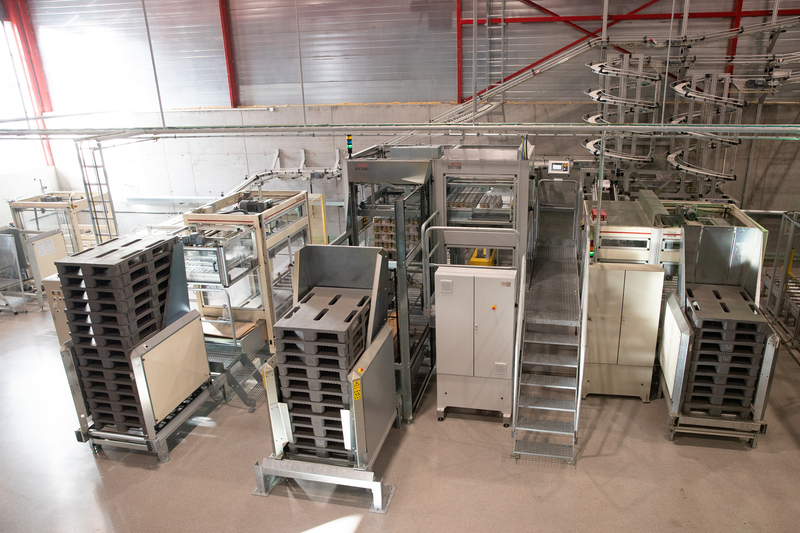 The machine will handled both boxes and open trays, palletized on euro and ½ pallets. – The technology behind InterSystems palletizer makes it easy for our staff to operate the machines, also easy to start and change between different types of products, says Kurt. Even if the palletizer handles 35 products/min, the machine works nice and smooth. A big advantage is that the machine never lifts the products, always support from underneath, so there is no risk that the product will fall to the ground, Kurt ends. Swedish InterSystem has supplied more than 600 palletizers so far and about 70% of them is for export.